What Day Of The Week Was April 9, 1969? 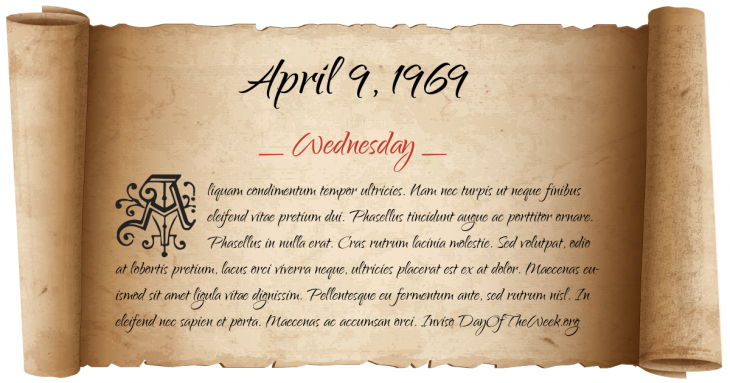 April 9, 1969 was the 99th day of the year 1969 in the Gregorian calendar. There were 266 days remaining until the end of the year. The day of the week was Wednesday. A person born on this day will be 50 years old today. If that same person saved a Cent every day starting at age 3, then by now that person has accumulated $171.78 today. The “Chicago Eight” plead not guilty to federal charges of conspiracy to incite a riot at the 1968 Democratic National Convention in Chicago, Illinois.